This disc is an essential part of the Martinů renaissance. For one thing, it is a continuation to, or supplement of, the complete symphony cycle recorded by Jirí Belohlávek and the BBC Symphony, released on Onyx (review). That was an essential release, and looks to be a classic, although MusicWeb International did not even name it Recording of the Month. 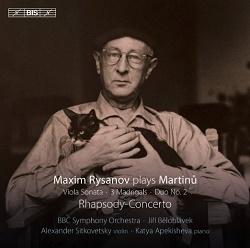 In addition, this disc conveniently compiles much of Martinů’s best work featuring the viola. Maxim Rysanov is the star performer and matches his very high expectations. All of these works date from after World War II, and thus from Martinů’s lyrical, more romantic late style. The Rhapsody-Concerto is a twenty minute piece in two movements, but with greatly varied episodes, such that it makes as satisfying a whole as many longer concertos. It begins with one of those lilting, chorale-like melodies common to Martinů, which skilfully blend minor-key foreboding into the major-key affirmations. The viola’s part is frequently virtuosic but most of the time it is singing and melodic, disproving the old cliché that a viola can’t be beautiful. The language of the piece, overall, will be very pleasing to you if you liked Symphonies 3-5, and the very brief cadenza has an almost Bach-like timelessness. There’s a noteworthy ending, with peaceful major-key serenity undercut by a menacing snare drum. The two Duos, in three movements each, offer much virtuosic opportunity for both players, since Martinů’s goal is, basically, to replicate the sound of a string quartet with only two instruments. Here he’s working in his more kinetic, rhythmically exciting mode; in the first movement of Duo No. 1, for instance, at least one instrument is almost always counting off the irresistible “one-two” that pushes the music forward. The first duo’s andante has strong echoes of rustic folk musicians; only the second work’s slow movement really provides a respite from Martinů’s nervous energy. Duo No. 2’s finale closes out the set with a burst of unalloyed joy. Rounding out the programme is the sonata for viola and piano, also the last piece on the album chronologically (1955). It has an earnest, autumnal, heroic quality: the music is not unlike the Rhapsody-Concerto, with an emphasis on questing long melodies rather than frenetic rhythms. The first movement begins with a slow, stately introduction which returns at its close. And the second — which, as in the concerto, is the faster of the two — ends, like the concerto does, with a moment of peace and acceptance. Maxim Rysanov is one of my favourite violists. His performances here are totally convincing and demonstrate both enthusiasm for and understanding of Martinů’s musical language. The same can be said for his partners. We already know the BBC Symphony and Jirí Belohlávek are unimpeachable authorities in this repertoire, but violinist Alexander Sitkovetsky lends formidable talent to the duos, and the relatively unknown Katya Apekisheva proves a worthy and equal partner in the sonata with piano. Recorded sound is phenomenal, as usual for BIS. BIS’s “usual” is most labels' “best.” The concerto recording, by the way, shares a producer with the BBC/Belohlávek symphony cycle, and shares an engineer with half of those symphony recordings. Only one thing could have made this album a more attractive package: a cover photo of the composer holding his pet cat and we get that too. What a pleasure all around. Maybe next BIS will have the BBC Symphony and Belohlávek record the music for violin and orchestra, with Vadim Gluzman - and Alexander Sitkovetsky in the double concertos. Please?